Bethany Lalonde has been a professional writer since 1997. She has published for CBS Health Watch, WebMD, the "Ann Arbor Daily News" and "Entertainment Weekly." She holds two masters degrees from the University of Michigan, in dietetics and nutrition as well as journalism. While vitamin D is most well-known for its role in calcium absorption, it also affects skin conditions, including acne and psoriasis, both of which can be caused by an insufficient amount of vitamin D. Because your body synthesizes vitamin D-3, a form of vitamin D, through exposure to sunlight, you may be tempted to improve your vitamin D levels through sun exposure. If you decide to do so, be aware of potential dangers from too much sun exposure, including sunburns and skin cancer. While hormonal balance and overall hygiene are primary causes of acne, a poor immune system due to low amounts of vitamin D in your system can also increase oil production in your skin cells. Acne forms when the sebaceous glands are clogged, and these blocked, oil-producing cells lead to the unsightly blemishes that can afflict you at any time in your life. Sun exposure raises your vitamin D levels as your skin releases a chemical that produces vitamin D. This reduces the amount of bacteria in your system by boosting your immune system, reducing the level of acne. When you have psoriasis, there is a thick, patchlike, layer of dry skin cells on the outer layer of your skin. It can be itchy -- there are different kinds of psoriasis -- and the condition is associated with a poor immune system and, in certain instances, low vitamin D levels. The "Journal of Investigative Dermatology" showed that when exposed to ultraviolet-B rays, the element of sunlight that kick starts the vitamin D production system in the body, vitamin D levels increased significantly, and the symptoms of psoriasis disappeared. Similarly, a study in "Rheumatology International" also found that increasing vitamin D levels helped improve psoriasis symptoms. The active form of vitamin D, also known as calcitriol, starts off as vitamin D-3 when sunlight directly touches your skin, starting a chemical reaction within keratinocytes. These are specialized cells that divide and differentiate constantly, giving your skin a steady supply of new cells. This is important because keratinocytes account for almost all of your total skin cells, around 95 percent. The rate of cell renewal and division is tied to the amount and presence of vitamin D in your system because it is dependent upon the vitamin's presence. A lack of vitamin D can lead to thinner skin that is more fragile and sagging. According to the Linus Pauling Institute, vitamin D-3 also helps to regulate anti-microbial proteins, namely cathelicidin, that not only support the natural immunity of the skin but also help with the general repair of damaged tissue. While vitamin D-3's presence in your system is known to support the healing of wounds, it is still unclear if applying it topically or ingesting it as a supplement will help heal the more severe cases of tissue repair, such as post-surgery healing. If you are concerned that your body lacks enough vitamin D and that this may have an effect on your skin's health, consult a medical professional before taking vitamin D supplements. Vitamin D is stored in your body fat and liver, and excess levels can lead to toxicity. 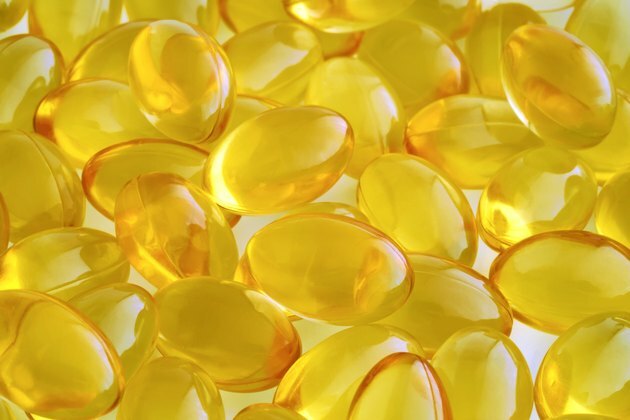 Taking more than 4,000 international units of vitamin D for all children and adults -- and more than 1,500 international units for infants -- can cause toxicity. Symptoms of excess vitamin D include calcium deposits in your soft tissue, kidney disease and kidney stones. For adults and children under 69, the recommended dietary allowance of vitamin D is 600 international units. For those over 70, the RDA is 800 international units. The RDA for infants is 400 international units. Does Vitamin A Help With Acne?